On the Menu…Live! » Zin, Blues, BBQ…and Blue! He’s a Certified Sommelier by the Court of Master Sommeliers, a Certified Specialist of Wine by the Society of Wine Educators, and arguably one of the most entertaining and erudite figures on the wine scene today who can rock a fedora like nobody’s business. 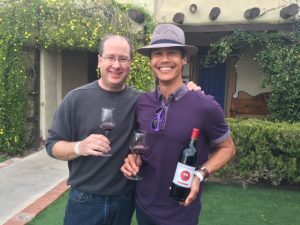 He’s also a Southern Arizona-based account manager with Quail Distributing, a boutique distributor of fine wines and other spirituous beverages, and this position puts him in a place of prominence at wine events across town, including the upcoming Zin, Blues & BBQ event at the Hacienda del Sol. James is in his element at these types of events because he’s not just pouring for the masses. It’s the fascinating stories that he tells about the hard-working families behind the wines that matter, the soil that’s specific to the regions and why we should care about it, the climate’s contribution to a grape’s ripening, and how these all collectively create memorable wine experiences. And when he’s talking Zins, believe me, you’re in for a treat. James is one of a number of wine distributors who’ll be pouring at this event and I hold them all in high regard. They each bring a unique style and exhibit a true passion for their work and the brands they represent. Collectively they’ll feature more than 35 distinct varieties of Zinfandel at the April 7 event, accompanied by pit-roasted suckling pig, pork ribs, beer-brined chicken, grilled salmon, and a seemingly endless spread of associated BBQ goodies from Hacienda del Sol’s Executive Chef Bruce Yim and his crew. Live music will also be served up by Hurricane Carla and the Bad News Blues Band. This event will sell out, so hop on it now and get your tickets here. Give me some big jammy Zins, smoked and succulent meats, and live blues and I’m in my happy place….as long as I can raise a glass or two with James Blue.